Surfing is one of the most popular beach sports today. To have the best time riding the waves means big waves, long white sandy beaches, and great weather. Having the best location for surfing will be enjoyed by any skillful surfer for long hours. If you are planning to have the next vacation surfing, then it’s ideal to find the best spots for surfing. These surfing hot spots can be found all around the world. Before you select ideal surfing destinations, ensure that they are free from any kind of danger. You should know about the sea life in that destination. If any surfing area has the creatures such as stingrays, sharks and jellyfish, then they can be dangerous to the surfers. The surfer should also ensure that there are not huge rocks, sandbars and reef in the ocean. If the surfer comes in contact with them, he may be badly injured. Hence, you select the surfing destination which is free from these kinds of obstacles. There are so many places around the world that are ideal for surfing. So to start off, let’s first head Hawaii the home of surfing. Hawaii is where surfing was born. For about 500 years ago, Polynesians where already riding the waves as a sacred ritualistic sport. From then on, Hawaii is known to be one of the best destinations for surfers. This is because Hawaii has large winter waves such as the Oahu which is found on the North shore. This surfing spot can be a good challenge for pro surfers with its 20-30 foot waves also called “wild water”. This destination boasts a beautiful sandy beach that stretches 20 miles. The waves are perfect during October to February. Most of the Californian coast has a long stretch with the pacific coast highway. It offers numerous surfing opportunities and an access to plenty of surfing spots. Manhattan or Malibu Beaches in California are ideal for the beginner surfer, while Mavericks outside San Francisco is prefect for the skilled surfer. In addition to this, Australia is considered as one of the greatest surfing destinations in the world. The dazzling Sunshine Coast spread along the sparkling Pacific Ocean can be called as a paradise for the surfers. Another great destination for surfers can be found in France. The West coastline of France has great beaches with varying quality of waves. The popular areas where the waves are just right for any surfer are in Biarritz, Hossegor, Le Penon, and Seignosse. North of Canary Islands and about 100 km from Moroccan coast is Lanzarote, while the two major resorts in the island Famara and Teguise can be found in the west coast and east coast respectively. Famara, known as a surfing haven stretches for about 1,500 meters long and the Teguise are great surfers and other water sports enthusiasts. The island of Bali has been popular as the epicenter of surf adventure since 25 years. The southeast trade winds begin in the month of March and continue till November every year. They offer good offshore conditions in the island of Bali and also provide unique opportunity to experience the thrill in surfing. If you want to gather more information on the ideal surfing destinations is through books, magazines, and the internet. With just a few clicks of a button, you’ll find thousands of results on surfing destinations. These sites will give you the needed information you’ll need and the best advice on how to pick on the best surfing haven for your next adventure vacation. The author is a multifaceted writer. She writes articles for a variety of topics such as marriage and relationship advices, buy handbags and leather handbag, family and parenting, health and safety, and a lot more. Surfing is one of the most thrilling sports there can be on sea. But unlike most sea sports, it does not require machinery of some sort. All you need in surfing are: a board, surfing gear, rippling waves and a sense of adventure. But just like any other sport, surfing can also drain your energy and patience. It can be grueling especially to the neophytes, as it requires perfect mind and body coordination. To have a body in total harmony with your inner self to get your body in the best surfing condition, surfers will recommend one thing and that is to practice yoga! You might think that surfing and yoga are far out from each other but you are wrong. Both have similar concepts that really blend well to give you a better life. Here are five reasons why surfing and yoga is a great combination. 1. Yoga and surfing have a common denominator. They are ways of life. Yoga is more than an exercise as surfing is more than a sport. Both are ways of living that help make people attain a fuller and more complete life. They also help you know more not only about yourself but also about your surroundings: yoga seeks enlightenment of your spirituality while surfing makes you one with nature. The yoga world is also similar with a surfing moment; a place of freedom, a place of peace, a place without time… Either way, you become your better person as you completely immerse yourself in the activity and in the process, rest your mind and spirit to release your fullest. 2. Surfing without exercise such as yoga can have health repercussions. Although surfing is a good exercise, it is not perfect because it is not completely symmetrical. Surfing does not work all body parts as it concentrates only on some especially the shoulders and arms. In the process, the rest of the body does not get its proper exercise. That is why it is always recommended that surfing be paired with a form of exercise that gives emphasis on stretching such as yoga. Yoga can work the body parts that are not frequently worked out in surfing. With that, you are ensured that you have a complete activity for your entire body. 3. Yoga will teach you patience in surfing. Starting to surf may be difficult to some people who do not have the skill of balance pros have. However, with a little more practice, you can gain more knowledge about reaching your body’s equilibrium but this may take time. Some may learn to surf in only a few days but some may take several weeks or months with a very long learning curve. With the help of yoga, meditation and breathing can make you become a more patient student surfer. The extended patience that you gain from practicing yoga can also be helpful while waiting for those surf quality waves to practice on. 4. Yoga will increase your strength and flexibility on the board. Yoga can enhance your self-awareness and make your body and mind exist in perfect harmony. Yoga will sharpen your concentration, enabling you to attain perfect equilibrium. Because yoga includes stretching and different forms to be followed, it will improve the flexibility of every part of your body. Flexibility is the key to constancy on top of the board while surfing a wave. Flexibility gained by practicing yoga also helps you move with more freedom, balance and comfort. And in this area, it is obvious how yoga can really be helpful. 5. Yoga will help you improve posture and breathing. Just like in yoga, proper posture and breathing is also important in surfing. You reach maximum performance when your body has proper amounts of oxygen taken in and is in the proper position. With yoga, you will learn to breathe and pose better. Yoga benefits such as minimized tension on the body especially on the back and the shoulders can maximize surfing performance. Proper breathing and posture will give you strength and balance that can increase stability while you glide on the waves. Surfing and yoga is a perfect complement that assists in excelling each other to higher levels and that is why most surf schools have yoga activities as well. The pair not only enhances your spirituality and physicality but also harmonizes your mind and body in perfect balance. So the next time, before you surf, practice a few minutes of yoga and breathing. Then you’ll realize that surfing is not only a purely physical activity but can have spiritual liberation effects as well. Me-Shell Mijangos (http://www.swellwomen.com/founder/html) a surfer who first began surfing at the age of 30. She is the founder of an all inclusive women’s surf camp called SwellWomen. Two years ago, she started SwellCo-ed, a Surf and Yoga Experience for women, men and couples. She hopes to surf with you in paradise soon! Visit her SwellBlog! Are you tired of just sitting on the beach and watching people enjoy? Most people love to sit on the beach while some who love adventure venture into the sea and enjoy some water sports. There are many kinds of water sports but the most common water sport is surfing. Surfing is a water sport where the rider rides the surface of the water and waves. Hence, surfing is just not about standing on the surf board but balance and keeping your body in rhythm with the waves and the intensity with which waves normally hit you. However, surfing has been diverted into various other styles and therefore you see that not everywhere people look out for a big sea to get their surf boards. Additionally, their equipments change as per the requirement of the surfing style they prefer. If you are not so sure about standing up on the surf board than try bodyboarding also known as boogieboarding. Bodyboarding is almost like surfing where people use a small rectangular board which is made up of hydrodynamic foam so that you can keep on floating even if you are hit by a strong wave. A lot of beginners prefer to go for boogieboarding instead of surfing because they can lie down on the board and enjoy the waves and all the water sport activities that they are missing. Many people often mix up bodyboarding with bodysurfing but the fact is that both these sports are different from each other to some extent. In bodyboarding the surfers do use a board on which they can float but in case of bodysurfing surfers do not use any floating equipment except swim fins that they use for propulsion. Bodysurfing is comparatively tougher than the bodyboarding because you really need to have control on your body and your body movements in order to get the right position so that you can move ahead with the waves. Bodysurfing is also known as big wave surfing in some parts of United States. Kitesurfing or kiteboarding is a modified version of surfing where surfers enjoy the combination of water and air but if you are a beginner than it is advisable that you perform kitesurfing only under supervision because kitesurfing can be really dangerous if you are not sure on how to handle the kite attached to your surf board. Generally strong powerful winds are needed to enjoy kitesurfing but if you are unable to handle your kite board than the wind might take you off and injure you. Lake surfing is just another style of surfing where people prefer to surf on the strong waves that develop in bigger lakes around their locality. Lake surfing is comparatively safer than sea surfing where you might get drown or carried away by strong winds and waves. In the United States a lot of people enjoy lake surfing in the lakes nearby their county. Wisconsin is the favorite state for all lake surfing lovers as it hosts the annual Dairyland Surf Classic every year. If you like to learn more on Costa Rica Surfing , visit http://www.surfvoucher.com/ where you’ll find Costa Rica Vacations packages and our Costa Rica Surfing Blog. Do you enjoy surfing and want to know more about it? If you are a newbie than you need to know more about surfing because the more you know the more you are aware of the small details that you should always keep in your mind while you are surfing or even when you are planning to go out for surfing. The best way to learn more about surfing is to join the surfing school where they give you all the tips on how to surf and what you should do and avoid, but if you are learning on your own than it would be wise that you keep learning about surfing from wherever you can. There are many hot locations around the world where you can enjoy surfing and if you are free you can certainly pack your bags and head to the destination but there are certain things you need to remember before you pick your surfing destination. Climate is the most important thing of all because you never know when the nature changes its mood. Of course, you can head to your favorite surfing destination but wouldn’t you be upset if you go there and find that heavy showers have swept the entire location and that the beach is close for few weeks at stretch. Surfers are really upset when the beach is close and therefore it is always advisable that before you head towards your surfing destination you double check the climate forecast of that destination. Surfing is fun during summers so a better idea would be to look for surfing destinations where the sun is shining brightly. Crowd is another important factor that you should look out for if that really matters to you. Some surfing destinations are so popular that they are crowded most part of the year and therefore you should avoid being at such surfing destinations. If you are new to surfing than you should stay away from crowd because you might not have total control over your surf board and unfortunately you might dash in with some other surfer. If you are a beginner always go for surfing destinations where there are less number of people because you will get better opportunity to ride the waves and you don’t have to worry about the other surfers crossing into you. You also need to make sure that you are going to a surfing destination where you can actually surf. Surfers are normally divided into different categories like beginners, intermediate and advanced surfers. If you are a beginner, than don’t head to surfing destinations in Australia and Ireland because most of the surfing destinations there are for advance-level surfing. You can instead go to places like Costa Rica, Hawaii and Canary Islands where the tides are low and where you will be able to handle yourself on the surf board. You can find most of the information available on the internet so make sure that you do a good research and than decide where you should head to for surfing. Surfing in Europe- Your Surfing Dream Come True! Surfing is a water sport, generally performed in oceans, in which the surfer rides on waves which take him or her towards the shore. Surfing is most commonly done using a surfboard. There are varied forms of like paddle boarding and body boarding, to name a few. One can avail plenty of surfing options in surfing Europe. Surfing France or surfing Spain makes for the ideal dream for every surfing lover. And not only for the experts, even for the novices or those who haven’t even experienced the joy of surfing, surfing Europe might be one way of how they imagine their perfect vacation to be. Portugal- There are seven well- known surf zones in Portugal, which in turn have multiple surf spots. The geographic location of Portugal favors the formation of high waves, making it an ideal place for surfers. Ireland- As a surfing location, Ireland has been a well- kept secret and is lately being revealed to travelers. The cool summers provide well suited conditions for water sports. Some other surfing destinations in Europe are Madeira, Canary Islands, The Azores and Iceland. France easily makes it to the top ten dream destination list of most of the people. Apart from the architectural beauty, the culture, the food, there are water sports opportunities available too. Surfing France would be a dream come true for all the surfing aficionados. Those who are vacationing in France and wish to try something new, what better an idea can there be than surfing France. On top of the beauty of the experience, how cool would it be to brag about surfing France to your friends? With some of the best beaches and surfing spots, surfing is a very popular activity in France. No matter what surfing facilities you want or whatever your budget may be, you will get it all in surfing France. Walking towards the tepid waters of one of the many Spanish beaches and the Spanish guitar playing in the background- does this image not excite you enough to just jump off your seat and book a ticket to the place? Spain has been a favorite surfing destination for a long time due to its warm weather and the wide range of surf spots offered for surfing Spain. It has a variety of spots which are ideal for the regular surfers who are looking for some adventures in surfing Spain. There is no dearth of spots as well as quality training institutions for the ones who have chosen Spain as the place to learn surfing. The Perfect Wave seeks to provide the quality surfing Spain experience in the most prime surfing locations around the globe. Those interested in having a Surfing France experience of a lifetime can approach The Perfect Wave to find the location most suited to one’s choices and also avail the best surfing packages. There are many options available for those that want to take up a sport that blends competition and physical exercise with a fun experience that can be remembered for a long time. Many of these options utilize a fairly traditional model; usually involving two opposing teams try to score an objective through a designated goal marker. For the more solitary athlete, there are many engaging choices as well. Usually, these people prefer solo sports that test their abilities and endurance, so that they can achieve a sense of satisfaction that comes from doing something personal and challenging. For these athletes, surfing is a desirable choice, not only for the challenge and thrill that it provides to participants, but also for the romantic imagery associated with the sport. It is an exotic option, which is largely perceived as an impressive activity, speaking to the character and capabilities of the person. Surfing is accomplished by having the participant swim out to sea on a large board specifically engineered and built for the purposes of the sport. They then attempt to catch an incoming wave so that they can turn their board around and stand upright on it, riding the wave into shore. Despite its simple premise, surfing is a complex and varied sport, which features a definite learning curve requiring many mistakes that need to be made before the participant fully understands what is needed to succeed. Technique and timing are highly important during this time, with brute strength or effort playing little part in the actual outcome. Surfing has many intricacies associated with it. Firstly, participants need to be able to swim, since they will spend the greater amount of time doing that. Additionally, they will need to know how to effectively read incoming waves, so that they can select the correct one to try to effectively ride. The characteristics of a wave that is able to propel a rider toward land quickly, without overcoming them completely, are fairly defined in their composition. Lastly, athletes need to be able to commit to an act, because once they are speeding along a wave, they will need to be able to navigate and correct their position without panicking and getting submerged. Unfortunately, one of the defining features of surfing is the risk, since it is possible to crash into rocks or drown if the appropriate precautions are not taken. Therefore, it is highly recommended that participants take a set of professional lessons before attempting anything technical, since the result will generally be failure. Experimenting in shallow waters with gentle waves is recommended for those that are trying to get the hang of balancing and movement issues. There are many physical benefits involved with surfing. As a general rule of thumb, athletes will become more fit as they participate, because of the extensive way that the sport works the body. The body is worked during the course of the activity in several distinct ways. Firstly, there is the aerobic workout that is provided by swimming. Swimming gives a full body workout, since most of the main muscle groups are necessary to propel someone through the water, even when they are riding a buoyant board. Due to the relative quickness of the physical act, participants will be swimming back and forth a lot. Next, there is the more explosive act of using the board to ride the wave. Participants need to stand quickly, often in direct opposition to the wave, and have the leg strength to stay balanced and correct their course. Surfing has a unique lifestyle that is attached to it, thanks in part to it romantic portrayal in popular culture. This romantic ideal is the reason why many people take up the activity, and choose to stay engaged in it. In actuality, surfing is a sport that requires many failures before success is found. It is hard work that requires patience and training. Surfing is a sport that manages to combine form and functionality, making for a very physically active sport that also manages to be very fun because of the unique thrill that it provides. The participants get to pit themselves against the elements using only a board and the principles of momentum and gravity, which makes for an experience that is not soon forgotten. Jack R. Landry has been writing about the exercise and health industry for years. He recommends using ellipticals to stay healthy and fit. The use of wind strength and kite surfing sizes is a technique every surfer should know. In this way, you change the sizes based on the strength of the wind. If the wind is strong, then use a small kite to avoid overpowers situations. Kite surfer, should measure the strength of the wind by using an anemometer or beau fort scale. In today’s kite surfing, you are given with depower to minimize the energy in it and the attack of the kite angle thus absorbing little wind in it as well as minimizing on the pull. Note that the speed of the wind, your experience, weight and size of the board, design as well as riding style are symbiotic to each other and would affect your choice kite. For professionals normally carry a quiver of various sizes suitable for that wind speed choice. Visit the centers and understand these size variations. When talking of wind direction in kite surfing, we mean wind at cross-shore, which has been proved to be the best. The only predicament is that it would be blown off the cross-shore if you lose control or where there is a mechanical failure of the machine. American Kite Surfing Association is leading organization for the kite surfers in the North America. And founded at 2006 by 2 extreme sport fans, and membership is been anticipated to get exceed 30,000 before an end of year. Purpose of enterprise is bringing the heightened awareness to fast growing, dynamic, as well as fun sport. Vast range of the products, information, as well as techniques that are accessible to visitors of AKSA web site. After over decade of the popularity by Europe & Australia, and active North American sport athletes are now recognizing maximum adrenaline rush by kite surfing. Plus another benefit for surfers is that when the winds are up and the surf is blown out, you don’t have to miss out on being in the water. Just grab your kite surf equipment and have fun. Kite Surfing has all the latest information about Kite Surfing. Check out Kite Surfing now. It should be noted that in kite surfing, if you make a turn in a poor way, it will fly you which is always preceded with a tumble as long as you fail to place the kite board on surface right angle. If the negligent turn was at high winds, it could simply swing you into the atmosphere, resulting in unabated effect. Besides turning, kite surfing involves jumping and flying. Jumping in this regard is the most popular technique of this sport. Prior to jumping, you always construct the tension between the lines by powerfully binding the board. There after quickly flow the kite at over head point, in the same way you would go over the wave. When the kite starts to lift, release board binder, allowing you to become airborne. Proceed by allowing the kite to be piloted from overhead towards the travel direction. Employ as many tricks and maneuvers as you could when jumping. Jumping in Kite surfing can also be dangerous, so you should maintain an obvious buffer zone at downwind. In jumping there is board grabs which are performed tricks used at that time. These grabs have different names depending on how they are grabbed. The kite surfing is the most adventure of things, which you may not forget. Also, you can actually enjoy the vacations with family as well as you can give them perfect delightful & adventures moment in vacation. The dramatic interest in athletically sport has provided AKSA founders encouragement regarding value of newly founded organization and it is just the biggest rush available. Combination of water, air, land, physical strength, wind power, as well as balance force of the nature are qualities, which attract many Kite Surfers all over the world. Put your entire body on the deck of your board, being mindful to maintain your weight focused on the center of the surf board. As you hit lumpy water or “chop”, lift your upper body a bit and decrease your weight on the board consequently the nose and rails don’t go beneath. Nonetheless, on a much more critical wave (i.e. Keep in mind that you will be balancing your right and left sides, head, and legs all while you paddle your surf board out to the lineup. So remember to start small and go out when there are little to no waves coming in. Time to understand how to paddle your surf board. Angling mid-face is actually a a lot more efficient use of the wave’s energy and helps you to remain ahead of the whitewater. You may be wondering what duck-diving actually is. Hence, the word “duck-dive!” Honestly, duck-diving had not been a thing My partner and i figured out right up until I’d surfed for two months. Knowing and predicting wave behavior will come with time (or perhaps but how you approach your drop-in will depend on the kind of wave your are riding. Waveriding strategy commences prior to a person even catch the actual wave. However for benefit of chronology, let’s discuss this technique prior to we all learn how to stand up. Now you possess the expertise to paddle to the lineup or even to the next wave and duck beneath it. Learning how you can stand may be the part of learning to surf that divides the happy from lame. Your initial action in studying how to paddle your surfboard is to wander your board out till you are in waist-to-chest deep water. Once you’ve figured out how to paddle, how to catch the wave, and how to stand up on a surf board, you need to climb to the following level associated with waveriding. 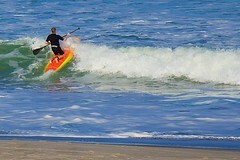 Whilst maintaining a low center of gravity (legs bent at the knees),casually lean the weight in the particular path you select and in the direction of the wave face (however always maintain your body centered over the midpoint of the board).This will certainly press the rail in to the water and create a keel effect, slicing in to the water and also directing the board in the path you select. Merely keep your arms out and your eye looking forward (remember: your surfboard will always follow your eyes and head, therefore focus on forward movement. If you are usually surfing a soft, sloping wave, then you may well would like to begin angling to the right of left even whilst you paddle. Surfing the Crest of a Wave is the pinnacle of modern cool- it is stylish on all fronts- from the innovative multi-panel design to the transfiguring power of the colors and shapes present in paint on the canvas- this painting is one that the viewer won’t soon forget! This painting more powerfully showcases a brilliant, captivatingly bright line of white. This line snakes across the canvases, creating a wave like pattern that is surprisingly graceful. Flanking this focal band of light are a series of shapes. These shapes are almost like tiles in their arrangement and orientation on the canvas. These tiles are repeated until they fade into the dark edges of the painting. Instead of depicting these small, repeated shapes in a single color, the artist has created depth and a more profound sense of dimension by using several colors. Nearest to the central line and point of light the colors are an intense shade of yellow, as they eye moves outward it is treated to a deep, seductive shade of red. This red hue slowly is deepened until, at the edges of the canvases, the design fades into black. The diverse quality of the colors in this piece make it quite moving. It is hard not to find some element of Surfing the Crest of a Wave that does not resonate right to your very core. Not only is Surfing the Crest of a Wave bold and refreshing in its color and expression- but the design of this piece is truly astounding! The artist of this piece has chosen to separate the movement of the painting across no less than five separate canvas panels! These panels vary in size and shape- three are rectangular and two are squares. The canvases are arranged to accentuate the curvature of the primary line. The synergy of all of these elements make for a quite engaging piece of contemporary are that no viewer will soon forget! The expansiveness and breathtaking scope of this piece make it a great fit for a room with a large empty wall to fill. If you are quite taken with the new and interesting perspective on line, distance and design that this painting presents you with, you may find many more paintings you enjoy for these reasons in our Modern Canvas gallery. Another original painting that shares some of the design choices and effects as Surfing the Crest of a Wave is Bullet Abstract. This piece is well worth a look if you are interested in similar designs!